On Thursday, April 25, I will once again be hosting a special event for older residents in the 131st District. Our annual Healthy Aging Expo will feature dozens of representatives from nonprofit agencies; local, state and federal governments; and local businesses who will provide information and answer questions about the programs and services they offer to area seniors. 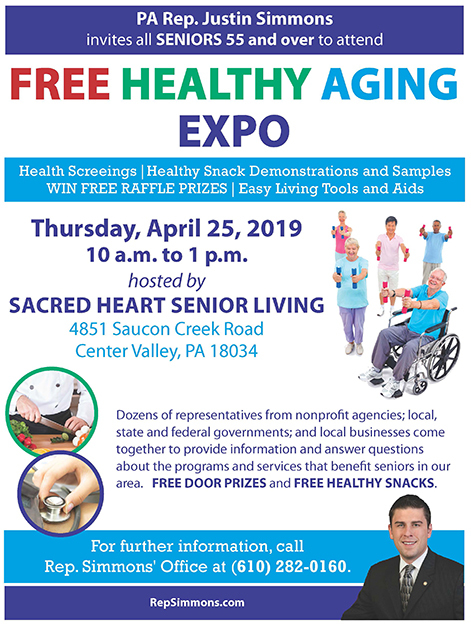 This free event will take place from 10 a.m. to 1 p.m. at Sacred Heart Senior Living, 4851 Saucon Creek Road in Center Valley. We hope to see you there! With fire and ambulance organizations across the state struggling due to a lack of volunteers and financial resources, the House and Senate Veterans Affairs and Emergency Preparedness committees held an informational meeting this week to discuss recommendations to address these challenges. According to testifiers, the decline of volunteers is having a significant impact on municipalities’ ability to reliably and safely provide public safety services to their citizens. Much of the decline can be attributed to societal and economic changes, such as longer working hours and longer commutes. Lawmakers were encouraged to consider incentives such as tax credits or college loan forgiveness programs to help recruit new volunteers. Affordable and accessible training was also encouraged to remove barriers to volunteering. These were among more than two dozen broad recommendations offered late last year by the Senate Resolution 6 Commission, which was charged with studying issues such as recruitment and retention, government support, innovation, training and operations, and more. You can read the commission’s report here. One of the recommendations, which requires insurers to reimburse ambulance companies for services provided even if no transport takes place, was signed into law last year. Lawmakers plan to build on that success this year as they prepare to introduce legislation implementing some additional recommendations. General Fund revenue collections for March were $4.55 billion, which was $76 million more than the Department of Revenue’s official estimate. So far this fiscal year, General Fund collections total $24.7 billion, which is 1.5 percent higher than expected. Learn more here. PennDOT has added several new license plates to its collection honoring veterans and their service to our country. The Honoring Our Women Veterans plate costs $35, of which $15 goes to the Veterans Trust Fund to be used for programs and resources that assist women veterans. The Soldiers Medal, Presidential Service Badge and Legion of Merit plates each recognize veterans’ specific contributions during their service. These plates are available for a fee of $20. Veterans must be able to show that they are recipients of the respective awards. Veterans from other countries can apply for a Veterans of an Allied Foreign Country plate, also available for a fee of $20. Motorcycle owners can now get the Purple Heart Medal Motorcycle plate, which displays the words “Combat Wounded Veteran” across the bottom. To get the plate, applicants must be able to prove they received a Purple Heart Medal and pay the $11 fee. Another new one is the Historic Military Vehicle plate, which is available for antique or classic vehicles manufactured for use in any country’s military forces. The vehicles must be maintained to represent their original military design and markings. This plate is available for both historic military vehicles and historic military motorcycles for $75.